The Little Giant Submersible Pump is specifically engineered to handle the tough, demanding tasks of high volume water transfers with high efficiency and long term dependability. This pump is built with a cast iron housing and impeller, a debris tolerant design, thermal overload protection, and with the protection of a mechanical shaft seal. 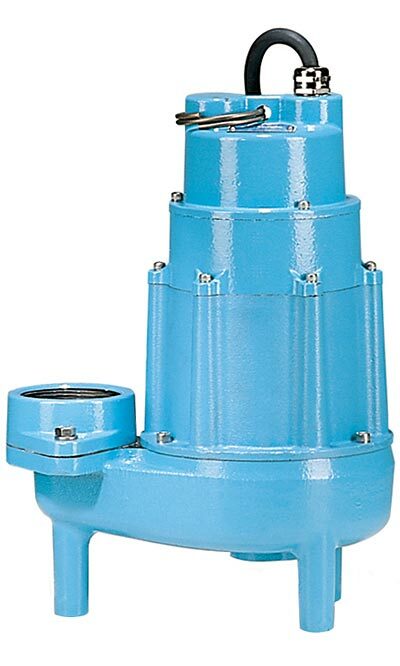 The rugged housing features an epoxy coating for corrosion and rust resistance and the dynamically balanced two-vane, non-clog impeller handles liquids containing up to 2" spherical solids. The ball bearing motor features a thermal overload protection preventing permanent damage to the pump in the case of overheating. A mechanical shaft seal offers dual protection against oil leaks. The 2 HP motor is capable of turning 12,300 gallons per hour at 10 feet of head and its permanent split capacitor design keeps it energy efficient. This rugged pump is perfect for powering a waterfall at extreme head heights. Two year limited warranty. Use this chart to determine the proper size pump for your application. The height of the water outlet above the surface of the water is called the Head Height. Gallons Per Hour (GPH) represents the maximum amount of water your pump is capable of pushing at a given Head Height. To ensure the pump's best possible performance, reduce frictional losses by using the largest diameter hose possible.